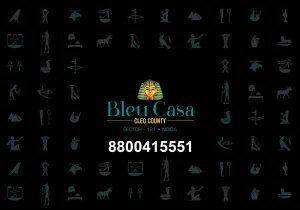 Bleu Casa is a newly launched set of towers in the Cleo County project of the renowned ABA Corp. Group in Sector 121, Noida. Cleo County which is inspired by Egyptian architectural theme has become the most sought-after luxurious project in central Noida. Lavishly spread across 25 acres of land, the Cleo County project promises of a resort type living amidst city life and Bleu Casa is like a shining star in South East Corner. The towers of Bleu Casa, Cleo County are opened on all sides with view of the greenery in the well planned Cleo County project, with a view of the open air amphitheater in the middle. httpwww.bleucasacleocounty.com/ Also, with complete access to Palm court surrounded by Palm trees, Island Court sitting area with water on all four sides, Giza court Pyramid shaped huts, Mist Garden artificial mist created to keep temperature down, Pillar of 5 senses – 9 meter tall stone structure with Egyptian engraving, 6 hole Golf Putting, 5 Acre Little Pharaoh Land, Wet play area, Swimming pool, Fitness centre with Spa, Yoga and Aerobics hall, Basket ball court and Snooker and billiard room, Bleu Casa is an epitome of modern living in a lush green environment. Bleu Casa towers in Cleo County are planned for the families who are looking forward for a luxurious living at affordable rates. Planned with 3BHK apartments within a Super Area of 1350 sq.ft , Bleu Casa towers are going to be a major hit among the residential apartments of NCR area. With limited inventory Bleu Casa, Cleo County is one project in Noida NCR, which demands immediate booking!